This is my 4th of July quiche recipe. Our annual family celebration will take place at the lake. Since we will have 16 people staying at the cottage, I love to search out recipes that are easy and will feed a crowd. 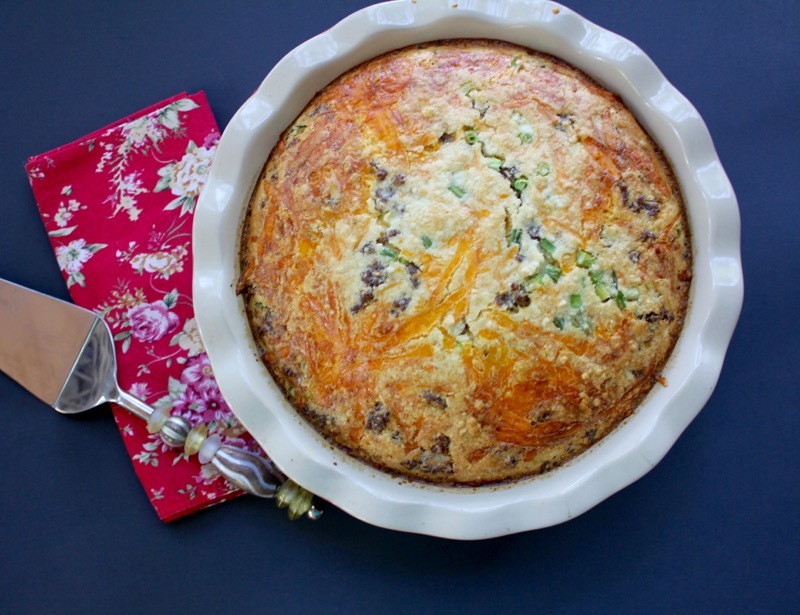 I plan to make two of these deep dish quiches. In place of a crust the filling includes Bisquick, which gives it more of a biscuit consistency. We are hoping that the lake will be back to normal by then. 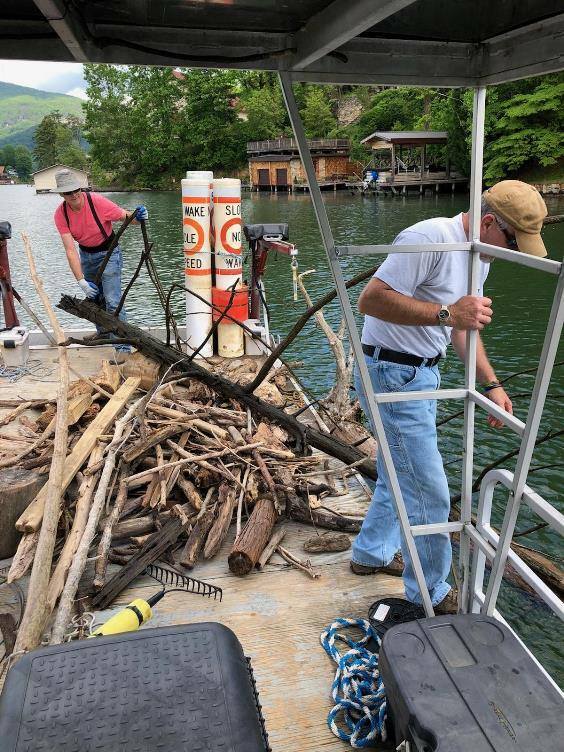 After two weeks of rain, the effects of Alberto, and the flooding, the lake became clogged with debris of all kinds including large tree branches. The town has been amazing in the clean-up efforts. Thanks to Esther for this photo. The sausage, cheddar and green onions are a tasty start to this dish, but you could substitute many other ingredients. Mine took longer to set in the middle than the 45 minutes specified. You could also try this in a 9″ x 13″ baking dish with a shorter baking time. We are looking forward to the 4th of July celebration. Preheat oven to 400 degrees F. Place sausage in lightly greased 2-quart round casserole dish. Top with onions and cheese. Beat eggs, half-and-half and baking mix with wire whisk until well blended. Pour over cheese and sausage. Bake for 45 minutes to 60 minutes or until knife inserted in center comes out clean. Cool 5 minutes. Cut into 8 wedges and serve. 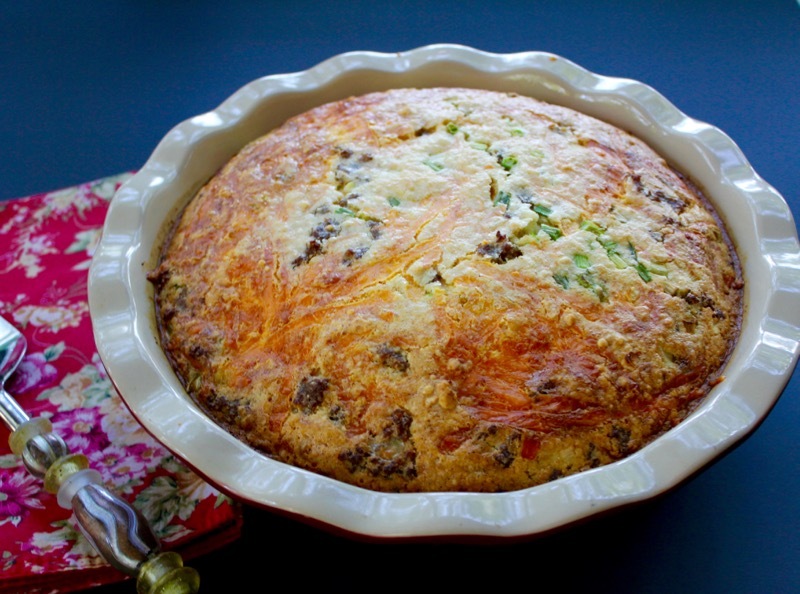 We are also looking forward to the 4th of July celebration and sampling that delicious quiche. The debris in the lake is incredible and it must be a tremendous effort to get it back to normal. Let’s hope the weather stays calm and we will see you soon! Weather has been much better Darla. Lake is looking much clearer. Looking forward to the 4th. Enjoy Wisconsin. Weather can make such a mess of so many things.. The sleepover gets a bit crowded Monique, but it is great fun. Hope your garden is doing well. That sounds wonderful Penny! Glad to hear the lake is getting cleaned up. Looking forward to our boat ride this weekend. It sounds like you are going to have a wonderful celebration with your big crowd. This will be a meal that I’m sure everyone is going to enjoy. Thanks Karen. Love the 4th. Oh goodness, what a terrible situation with your beautiful lake. You have good people around to help in such a crisis. I found out we had some flooding in Biltmore Village but thankfully we are on a hill. I was just thinking about quiche today because I have a lot of milk for some reason!! I’m going to try this. The Bisquik will be new to me. Have a wonderful 4th! We have a crowd coming, too. I assume you will be at the lake for the 4th. Enjoy it Jane. I saw the picture of Asheville flooding. So glad your place is on high ground. This looks like a good dish for a ladies luncheon. Simple and delicious. I agree Bonnie. I hardly ever use Bisquick anymore but like it in this quiche. I think it will be a delicious and fun gathering, Penny! With the lake all spruced up your family is going to have a great time. I know they’ll love that delicious quiche! Thanks Susan. Hope you have a wonderful 4th also. This post was published by Penny on June 6, 2018.